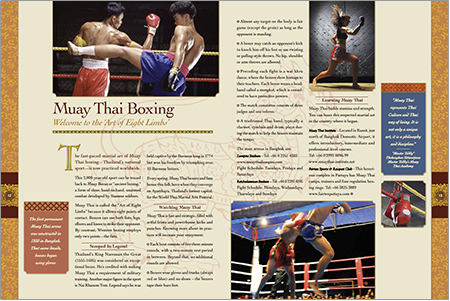 The legendary sport of Muay Thai boxing gets its due as part of this advertorial on the cultural attractions of an extraordinary country. Project manager: Retta Jitner, Media Matters. This 2,000-year-old sport can be traced back to Muay Boran or "ancient boxing," a form of close, hand-to-hand, unarmed combat developed by Siamese soldiers. Muay Thai is called the "Art of Eight Limbs" because it allows eight points of contact. Boxers can use both fists, legs, elbows and knees to strike their opponent. By contrast, Western boxing employs only two points—the fists. Thailand's King Naresuan the Great (1555-1605) was considered an exceptional boxer. He's credited with making Muay Thai a requirement of military training. Another major figure in the sport is Nai Khanom Tom. Legend says he was held captive by the Burmese king in 1774 but won his freedom by triumphing over 10 Burmese boxers. Every spring, Muay Thai boxers and fans honor this folk hero when they converge on Ayutthaya, Thailand's former capital, for the World Thai Martial Arts Festival.